All employees, including student employees, must have a business email address to access Human Resource System (HRS) self-service and to receive payroll and benefits communications from the UW Service Center. Employees are assigned a default address but can choose a preferred business address in the MyUW Madison Personal Information module. 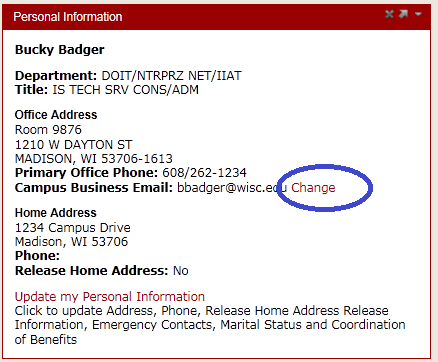 Note: UW-System Administration of Extension employees with a Dane County business address will see the change button to edit their campus business e-mail address, but it does not function as expected. If you are a UW-System Administration or Extension employee with a Dane County business address, please contact your local Human Resources to update your campus business e-mail address. UW-Madison employees, please follow the instructions in this document. An activated Madison NetID. See NetID - Activating Your Account or My UW Early NetID Activation for New Employees (UW-Madison only). Once these steps are complete, the employee will automatically be assigned the default Office 365 email address (typically netid@wisc.edu ). This gives the employee access to HRS Self-service in My UW. Log in to My UW and find the Personal Information application. If it is not on your Homepage automatically, you may need to search for it in the search bar and press the green Launch button. If you are using the MyUW Classic layout, you can find Personal Information under the "Work Record" tab. In the Change Email box that appears, enter the new email address twice and click the Update button. Allow at least two hours for most systems to be updated with the new address. HRS and the Madison White Pages directory listing on www.wisc.edu will be updated overnight.